For other uses, see Serris (disambiguation). 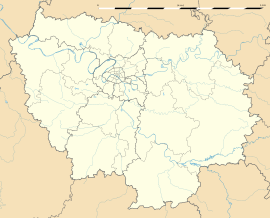 Serris is a commune in the Seine-et-Marne department in the Île-de-France region in north-central France. Inhabitants of Serris are called Serrissiens. The commune has four primary school groups (combined preschool and elementary schools): Robert Doisneau (opened in 1999), Jules Verne (opened in 2001), Jean de la Fontaine (opened in 1992), and Henri Matisse (opened in 2004). Collège Madeleine Renaud, a junior high school in Serris, opened in 2005. Lycée Émilie du Châtelet, the senior high school, opened in 2010. University of Marne-la-Vallée provides university education in the area. As of 2016[update] 1,300 of its students resided in Serris. ^ "Groupe scolaire Robert Doisneau Archived 2014-08-31 at the Wayback Machine." Serris. Retrieved on September 3, 2016. ^ "Groupe scolaire Jules Verne Archived 2014-08-31 at the Wayback Machine." Serris. Retrieved on September 3, 2016. ^ "Groupe scolaire Jean de la Fontaine Archived 2015-02-23 at the Wayback Machine." Serris. Retrieved on September 3, 2016. ^ "Groupe scolaire Henri Matisse Archived 2014-08-31 at the Wayback Machine." Serris. Retrieved on September 3, 2016. ^ "Collège Madeleine Renaud Archived 2015-02-23 at the Wayback Machine." Serris. Retrieved on September 3, 2016. ^ "Lycée Émilie du Châtelet." Serris. Retrieved on September 3, 2016. ^ "Pôle universitaire du Val d'Europe ." Serris. Retrieved on September 3, 2016. Wikimedia Commons has media related to Serris. This page was last edited on 16 April 2019, at 19:15 (UTC).